In 2013 and 2009, he spent the Summer as the Principal Trombone with the Seattle Opera for Wagner's Ring Cycle. He has also performed with the New York Philharmonic, Boston Symphony, Chicago Symphony, San Francisco Symphony, Cincinnati Symphony, National Symphony Orchestra, Baltimore Symphony, Houston Symphony, Tanglewood, Music Academy of the West, and the Aspen Music Festival. 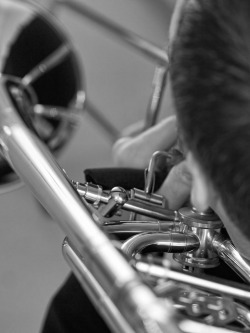 Nathan has received numerous awards including Special Prizewinner at the Budapest International Trombone Competition and First place at the Zellmer, Frank Smith Memorial, and Robert Marsteller Solo Competitions. Originally from Fairview, Oregon, Mr. Zgonc earned his education at Indiana University, San Francisco Conservatory, and Manhattan School of Music. He is featured on recordings with the Atlanta Symphony, Vancouver Symphony, San Francisco Symphony, Atlanta Symphony, Oregon Symphony, US Navy Band, and Seattle Symphony and Opera. On September 18, 2010, Nathan Zgonc gave the world premiere of Aura by Tony DiLorenzo, in honor of his mother, the late Lorely Zgonc. Nathan spends his time off with his wife, Karen, their 11 year old, Jason, and 6 year old, Tristan.